RIMPAC is an important, biannual Oahu Event. Every other year, military personnel travel to the Island to participate in the largest military warfare exercises in the world. The Oahu Hotel has special offers to welcome visitors who come for this and other top Events on Oahu. In 1971, the first RIMPAC Exercises (Rim of the Pacific) was held, and the Oahu Event was held annually until 1974 when it moved to biannually. This year marks the 25th anniversary of RIMPAC. Several countries take part each year, but it is the United States military at the helm. 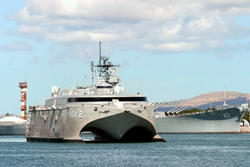 RIMPAC is led by the Navy’s Pacific Fleet, which is headquartered in Pearl Harbor. The exercises are completed by the Navy’s Pacific Fleet along with the Coast Guard, the Marine Corps, and the Hawaii National Guard. Several other countries either participate or observe by invitation of the U.S. military. Some of the countries that will be participating or observing during the 2016 RIMPAC are Russia, China, Chile, Colombia, France, Australia, Canada, New Zealand, South Korea, Singapore, Malaysia, and Thailand. India will be participating for the first time. This Oahu event includes participation from 50 warships, 200 aircraft, and more than 25,000 personnel. Special operations teams also take part in RIMPAC, the goal of which is to enhance the ability of various organizations to work together to provide greater security to the Pacific Rim region. Those planning to come for RIMPAC or other top Oahu Events can make reservations at Courtyard by Marriott Waikiki Beach by visiting the Oahu Hotel’s website or by calling 877.995.2638. The Oahu accommodations at Courtyard by Marriott Waikiki give every guest the chance to experience all the best that Oahu has to offer – all within a short distance of this conveniently located Honolulu Hotel. Courtyard by Marriott Waikiki Beach is just a few steps from the world-famous Waikiki Beach and a short drive from Honolulu International Airport. The beautiful, newly-renovated guest rooms at Courtyard by Marriott Waikiki feature comforts and amenities that make visitors feel right at home. Guests can email or post pictures using the Oahu Hotel’s super-fast complimentary internet connections, watch movies on flat panel TVs, and get tips from the Concierge about Oahu attractions, Oahu events, Oahu activities, Oahu restaurants, Oahu shopping, and more. Private Balconies and Dreamer Beds with Pillowtop Mattresses assure a relaxing stay. Planning a visit to Oahu? Choose Courtyard by Marriott Waikiki Beach. The ideal location, newly-renovated Guest Rooms, thoughtful amenities, and attentive service keep guests coming back again and again. Call 808.954.4000. Browse the Hotel’s Oahu Visitors Guide for information about attractions, activities, dining, and shopping. View the beautiful Guest Rooms at this Oahu Hotel. Courtyard by Marriott Waikiki is an ideally-located Oahu Hotel located just steps from world-famous Waikiki Beach.